Back in the early 1980s, word spread about an inviting little personal computer that used something called a mouse and smiled at you when you turned it on. Steven Levy relates his first encounter with the pre-released Mac and goes on to chronicle the machine that Apple developers hoped would "make a dent in the universe." 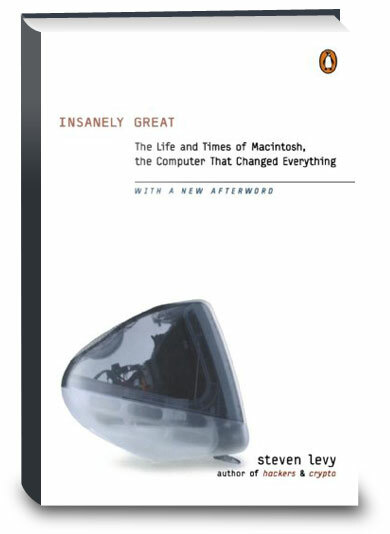 A wonderful story told by a terrific writer (Levy was the longtime writer of the popular "Iconoclast" column in MacWorld; he's now a columnist withNewsweek, the birth and first ten years of the Macintosh is a great read. nsanely Great takes a look at how the Macintosh evolved from a garage with two hippies and a soldering iron into a multi billion dollar company. Unlike what the title suggests this book does not spend a whole lot of time talking about Steve Jobs. Instead, this book focuses on a part of Apple's history that is really, as far as I have seen, not very well documented. It discusses in detail the evolution of the Macintosh from the inside, talks to people directly involved with the project and really shows this part of the computer revolution from the inside out. For those of you who are PC users this book will help you understand the Mac way of thinking. Levy is a true Mac person but writes in a fairly unbiased manner. This book is a great read for anybody who enjoys the history of how computers became what they are, as well as all Mac users. Click the button below to add the Insanely Great: The Life and Times of Macintosh to your wish list.